The creation of the architectural detail generally involves the bringing together of discrete elements, systems and materials through mechanical attachment. A new software platform with an expansive and fluid approach to matter and scales may allow us to move from discrete elements to integrated systems, leading to a revolutionary world of architectural details. 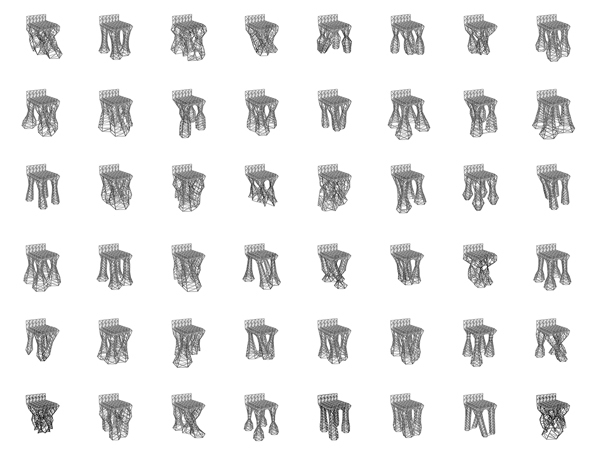 One application is multi-objective optimization of new human-scale structures. In the Evolving Chair project, for example, the design of a novel chair structure would not have been possible without the unique computation and manufacturing techniques provided by this new software platform. A manageable standalone object for a case study, the chair structure involved all of the same factors, opportunities and challenges of designing architectural details.